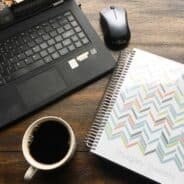 In case you haven’t been following too closely, I thought I would take the time for a little catch up, not only on my life, but about what’s happening on the blog! First, my son proposed to his girlfriend this summer. (OMG!!!) So there’s that bit of excitement as we look forward to a wedding next year! Please please please, give me all your mother of the groom advice. Specifically, what to wear, haha! My oldest daughter left for her freshman year of college this month too. Our family is changing, and as much as I want to just hold them tight, I need to learn to let go! I miss my kids terribly, but they are doing amazing things already, so it’s hard to not also feel so proud! I went parasailing for the first time…and last time. 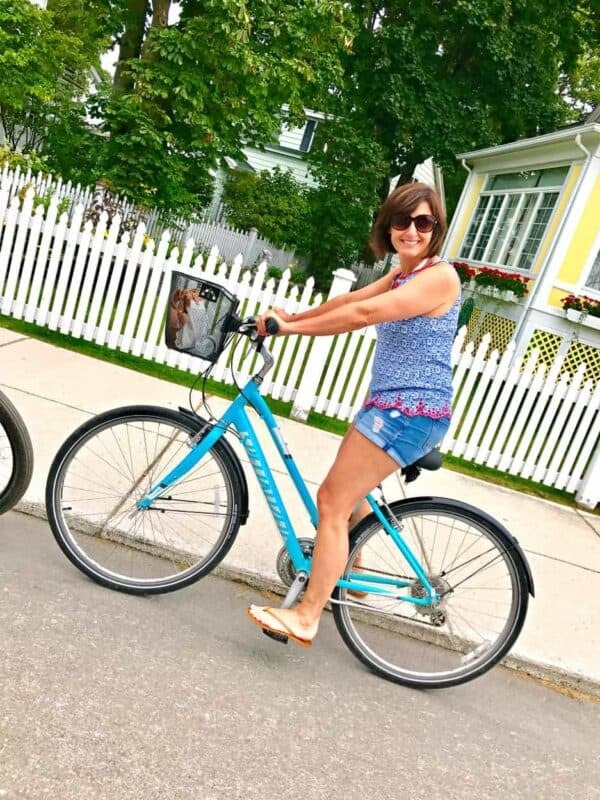 We had a great vacation on Mackinac Island, Michigan (see my bike photo above)…and ended with this once in a lifetime parasailing trip with the kids. Needless to say, I think I like being on land or on water…not in the air, haha. Still at home I’ve got two teen girls. One who recently decided to become vegetarian (and I’ve joined her in an effort to support her journey)! You’ll see on the blog, I’ve got some new vegetarian options. Like these Zucchini Meatballs and this BBQ Jackfruit Sliders recipe! But don’t be confused when you see the occasional meat recipe…like Cajun Sausage Pasta. I still have carnivores in the house who like meat, and I try once a week to make something just for them! Well, that’s all the changes happening here at my house…how about we talk about what I’m loving and what’s coming soon to the blog! I’m currently reading “All the Ugly and Wonderful Things” by Bryn Greenwood. You guys, I can’t tell if I like it or hate it, but it definitely makes me sad on so many levels. If you’re looking for your next book club book, this one will definitely get you all talking, that’s for sure! I’m obsessed right now with Pumpkin. It happens every September. The time comes when I want to pumpkin all the things, and I think I wear you all out, haha! I’ve recently been making some videos for some of my popular pumpkin recipes, like this Pumpkin Pie Smoothie (it’s HEALTHY!!) and this Pumpkin Zucchini Bread (it’s well, it’s not healthy?)! What is YOUR favorite flavor? I love the Holderness Family. So speaking of Pumpkin, this great debate happens every year at my house. Have you seen the video? I’m heading out on another Princess Cruise this fall…to Turks and Caicos! Give me your favorite place to eat on the island, I’ll do my best, haha! Meanwhile I can’t wait to eat these Almond Croissants every morning! I’ve become slightly obsessed with Instagram stories. Some days I show you guys fun tricks, and sometimes it’s just my dogs, haha. Who do you follow on instagram? I ordered this little gadget for $15 on Amazon as a stocking stuffer for my husband. I love when I can pick up some early gifts! I bought a new waffle maker. And I love it. My daughter who left for college took mine, so I had to replace t. I also recently saw these waffled crab cakes (oh I guess I’m pescatarian since I eat seafood). That recipe is happening soon. And if we’re going to talk about recipes, have you seen this homemade garlic naan?? It’s getting made soon. Because NAAN. I die. What’s coming soon on Shugary Sweets? Well, if you remember these Vegetarian Zucchini Meatballs, I’ve got a new version coming: Greek Zucchini Meatballs with Tzatziki. You guys are going to love it (yes you will, you carnivore follower, trust me)! Oh, and another jackfruit recipe is in the works as well! Also, stay tuned, the week of October 9th is APPLE WEEK here. I’ve got three new recipes all with apples that week that you won’t want to miss! I’ve joined up with Jocelyn from Inside Brucrew Life and Crunch Pak apples to share some incredible recipes. And speaking of Crunch Pak apples….they now sell Apple Rings. Yes, you heard that right. You can now APPLE RING all the things. Like these Apple Ring Fritters! You’ll also be seeing my recipe for THE PERFECT CHEESECAKE coming in October. I think you’ll love this one! Finally, tell me what holiday treats you’d love to see on the blog here? Are you looking for something specific? Whether it be for Thanksgiving or Christmas? Do tell!!! I’m sorry to hear you were planning a cruise to Turks & Caicos,. I love Princess cruises too and I don’t think the caribbean will be the same for a long time. Turks and Caicos? There are many videos on You Tube showing the devastation there and surrounding areas! Good luck! I know, it makes me sad for that area! And Puerto Rico too! Tooo toooo bad about the trip. But sheesh so much yum and wonderful going on! Sounds like you’re embracing sweet moments in life – I appreciate you for that! Not liking your recipes lately. Your vegetarian choice seems to have changed things a lot. I’m sure some people will like them, but many will not. Mackinac Island is an amazing place!